Found along the Mediterranean sea in Israel, this area has witnessed miracles in the past. Tel Aviv is located on the old port city of Joppa (also called Jaffa), where Peter raised Tabitha from the dead in Jesus’ Name (Acts 9:36-43). Two centuries later, Jesus healed again and this latest miracle caused a buzz in the city. Even Tel Aviv radio and TV stations broadcasted the incredible healing of Therese Daoud, a Messianic Jew. Doctors at Tel Aviv’s Ichilov Hospital did not have good news for Therese when she showed up complaining of pain in her ankle and leg. MRI scan revealed an orange-sized tumour in her leg. A biopsy indicated it was sarcoma cancer which according to specialists is one of the worst forms of cancer tumors because of its aggressiveness. 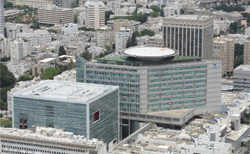 Concerned, the Israeli doctors sent the tests to specialists in the U.S., who confirmed the diagnosis. To save her life, the doctors told Therese the only course of action was amputation. When Therese showed up for her second appointment, the hospital postponed again saying a number of emergencies had come in and staff had to be pulled away. The hospital rescheduled Therese’s appointment a third time. But now things were happening in Therese’s life. She postponed the third appointment because she needed to care for her mother who was gravely ill. When she told her doctor — Professor Yaakov Bickels head of the hospital’s Orthopedic-Oncology Department — about her decision, he was very concerned. But three months later, Therese shocked Bickels when she showed up at his office alive and seemingly better. He immediately sent her for an MRI which showed a shrinking tumor. Stunned, Bickels ordered a second biopsy a short time later which he personally supervised. The test showed the cancer was gone. When Bickels asked Therese what happened, she replied after returning to Ussfiya — an Arab village located outside Haifa — to look after her mother, she fervently prayed to Yeshua (Jesus) for healing and Jesus answered. “This just does not happen. A growth of this kind cannot recede like this. The medical staff was so stunned they rechecked all the tests — old and new. Medical personnel and newspaper reporters even visited Therese’s home to test the water and food to find an explanation for the miracle. But there was none — other than the fact Jesus still heals today. Will Jews accept Jesus as their Messiah? It was also at Joppa where Peter had his vision of the clean/unclean paving the way for the gospel going to the gentiles (Acts 10:8-23). Maybe this latest miracle will result in a number of Jews accepting Jesus as their Messiah.